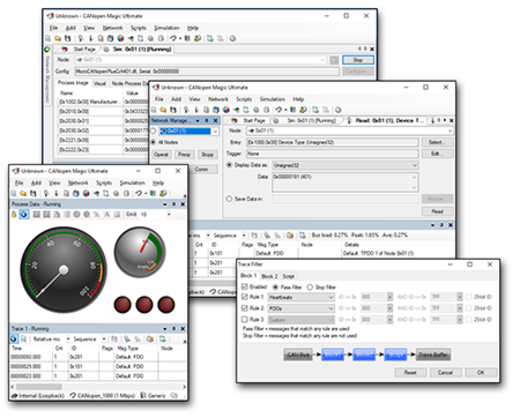 CANopen Magic Professional for PCAN is a versatile software tool to monitor, analyze, trace, configure, simulate, and test CANopen and CANopen FD networks and devices. It contains functions for the entire lifetime of a CANopen network: from development and test to system integration and performance analysis. Use sophisticated trace filtering and node access to monitor, analyze, and test all aspects of your network. Simulate nodes that are still under development. It supports all PEAK-System PC CAN interfaces. For all information about CANopen products for PCAN, just click on the following link: www.peak-system.com/quick/CiA-CoPG-2. If you have questions about CANopen® or CANopen FD®, just write an e-mail to canopen@peak-system.com. Multiple trace windows with accurate, high-resolution timestamps and individual filter settings. Detailed CANopen and CANopen FD interpretation of all messages on the network. Including long-term logging support. PDO configuration windows allow at-a-glance access to all PDO configuration parameters of a node. Communication and mapping parameters can be changed by point-and-click. Multiple windows allow to view the PDOs of multiple nodes at the same time for easy PDO linking and data mapping. For more information about PEAK-System, please visit the manufacturer's website: www.peak-system.com.